Take advantage of it and you'll waste less energy. Holding a hot cup of tea on a cold December morning is a lesson in the power of residual heat. Understanding how to harness that energy in your kitchen for more than just warming your hands will make you a greener cook. Residual cooking – also called carry- over cooking – is when food continues to cook after it has been removed from a heat source. The heat held within the food itself raises its overall temperature before it starts to cool down. It’s a gentler, radiating heat that equalizes the temperature throughout the food. Bok Cheet Gai is Cantonese comfort food. To succeed, you must start with a high-quality chicken, which is cooked gently using residual heat to keep the meat very tender. In this dish – which is served at both Chinese wedding and New Year celebrations – the white meat symbolizes purity and serving the entire bird represents unity. Serve this version, an adaptation of about a half dozen I found on Chinese food sites, with soy-ginger dipping sauce and plenty of steamed white rice. To make the chicken, rub the chicken inside and out with salt. Stuff scallions, garlic and ginger into the cavity of the chicken. Bring 14 cups of water, the mirin and peppercorns (if using) to a boil in a deep 7- to 8-quart pot. Add the chicken, breast side down, and reduce the heat. Simmer, covered, for 20 minutes. Remove the pot from the heat and let it stand, covered, for 30 minutes. Turn the chicken over and let stand, covered, for 15 minutes more. Check the temperature of the chicken using a thermometer inserted into the thickest part of its thigh. It should read 165 degrees. If it does not, bring the water back to a simmer. Cover. Turn off the heat and let the chicken stand in the hot, seasoned water for 15 minutes more. While the chicken cooks, fill a large bowl three-fourths full with ice and cold water. 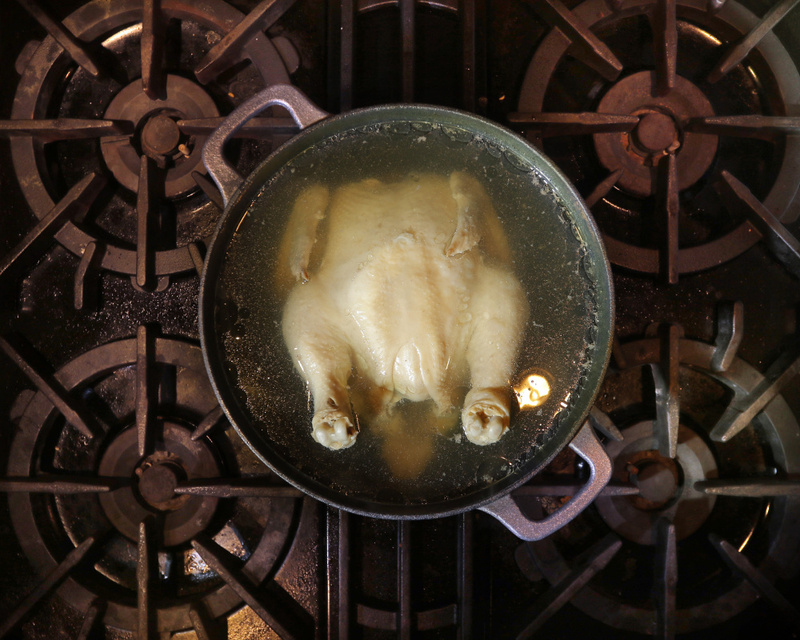 Carefully remove the chicken from the pot with a large slotted spoon and plunge into ice water to stop the cooking. Let stand, gently turning over once (be careful not to tear skin), until cool, about 10 minutes total. Place the chicken on a cutting board, remove the aromatics from the cavity. Pat dry and rub the skin with sesame oil. Strain and save the stock for soup. To make the dipping sauce, stir together the scallions, cilantro stems, soy sauce and 3-4 tablespoons of the stock from cooking the chicken in a small heatproof bowl. Heat a skillet over high heat. Pour in the oil and tilt pan to swirl the oil. When the oil begins to smoke turn off the heat and carefully add ginger and stir-fry 30 seconds, another example, incidentally, of residual cooking. Pour the flavored oil over the scallion mixture, stirring to combine. Carve the chicken as you would a whole roasted one and arrange it on a platter. Drizzle 2 tablespoons dipping sauce over chicken and sprinkle with cilantro leaves. 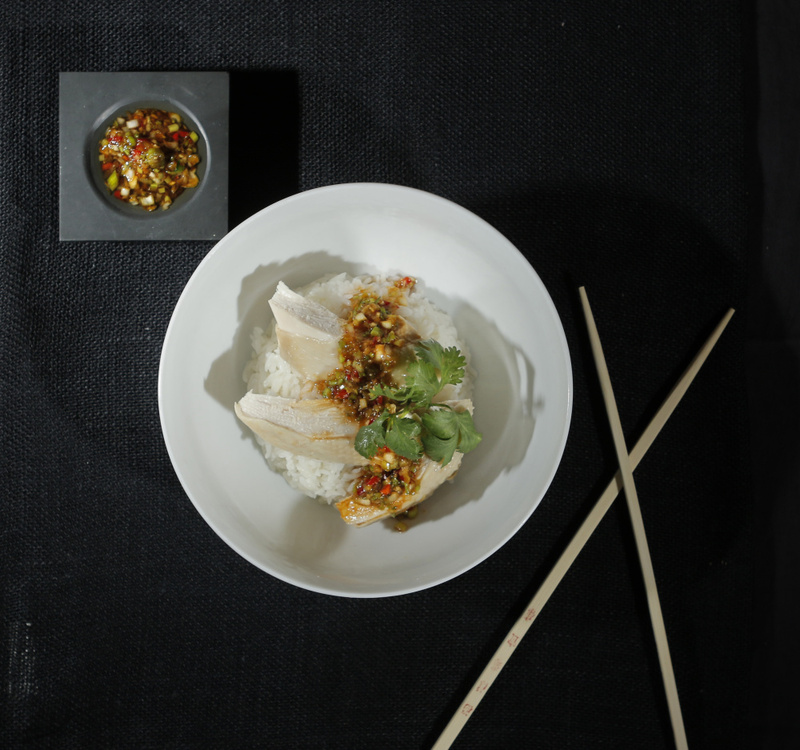 Serve warm or at room temperature, with a large bowl of steamed rice and the remaining dipping sauce on the side. In culinary school, I was taught to make accommodations for residual heat so that grilled steaks would end up cooked as ordered and green vegetables were not reduced to gray mush. The temperature of a resting steak or chop will rise 5 to 10 degrees and a large roast will cook another 15 degrees because of residual heat. Many green vegetables – green beans, snow peas, broccoli and kale, to name a few – need a few minutes to cook to crisp tender perfection. So chucking them into the pot once you’ve brought the salted water in it to a boil and have turned off the heat will provide plenty of heat to cook them. 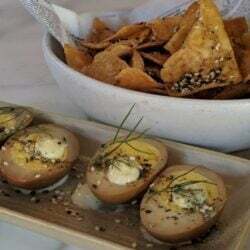 More recently, I’ve learned to seek out and take advantage of residual heat sources throughout my kitchen in order to decrease my fossil fuel consumption as I poach fish or chicken (see recipe), bake cookies, scramble eggs, steam rice or warm sauces. My primary sources are my heavy-bottomed pans, ceramic baking dishes, cooling oven, stove-top grates, make-shift pan lids and the top of my refrigerator, the coziest place for dough to rise given that the motor is always running. If there is a cook on your holiday shopping list, I suggest buying him or her cast-iron skillets or their enameled Dutch oven counterparts. They make great green gifts as both hold onto heat better than thinner aluminum-based cookware and therefore help promote carry-over cooking. That said, cast iron is not the best initial conductor of heat so it’s best to warm such pans either in an already hot oven or over a burner equal in size to the pan. Ceramic and glass baking dishes (another solidly green gift) conduct and retain heat better than metal so you can reduce oven temperatures by 25 degrees and count on residual cooking when you pull them out of the oven. When I bake – mostly in or on aluminum-based cake pans or cookie sheets – I turn my well-insulated oven off with about 20 percent of the cooking time remaining and let my cookies, bars and cakes coast to the finish line – without opening the oven door, of course. I’ve also learned to keep the timer running so that I don’t forget altogether that the baked good is still in the oven so they don’t burn. I use my cast-iron skillets (which live on my stovetop for easy access) as a makeshift pan covers when cooking either potatoes or pasta because it serves as an ideal spot to warm milk and butter for mashed potatoes or a tomato sauce for pasta. The residual heat held in the stovetop burner grate used to boil water for green vegetables provides the perfect temperature for making a brown butter and caper sauce in which to dress them. Finding (and subsequently using) new sources of residual heat in my kitchen has become a personal adventure for me. So far, my exploration has relied on my sense of touch, as in, “Ouch, that’s still hot!” Perhaps, should my very own Santa be reading this, I can suggest that an infrared thermometer would be just the right stocking stuffer this year?